The San Francisco community came from Guadalajara, Mexico in 1928, fleeing the persecution of the Church which was taking place under the government of President Calles. 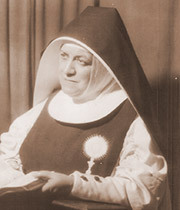 Faced with a July 1926 edict ordering the closure of all the churches in the Republic of Mexico, Mother Gertrudis, the Superior of the community in Guadalajara, began to think more seriously about the possibility of transferring her entire community to the United States since it would clearly be nearly impossible to continue with this life of continual fear which was preventing the Sisters from living out their vocation in peace. The first group of Sisters left Guadalajara on July 18th, 1926 for Los Angeles, California. In summer 1927, two additional groups of Sisters from Guadalajara arrived in San Diego. The reason the Sisters could not remain in Los Angeles or San Diego was that the Archbishop there asked them to work providing religious instruction to Mexican immigrants; Mother Gertrudis respectfully made him aware that our vocation was to be Eucharistic contemplatives. One day while our dear friends the Carmelite Sisters from Mexico were staying at the Convent of the Immaculate Heart in Hollywood, California, a tall, Irish-born Jesuit priest named Dionisio Kavanaugh came to celebrate Mass there. Noticing the Carmelite Sisters, he asked who they were and was told that they were "the Carmelites from Mexico" fleeing the persecution of the Church that was taking place there. He immediately wanted to visit them and offered to help them in any way he could. 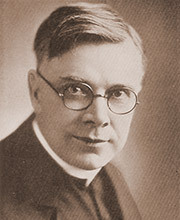 Father Kavanaugh lived in San Francisco, and he quickly arranged for all the Carmelite Sisters to leave Hollywood and establish their community in San Francisco. Once settled in San Francisco, the Carmelites wrote to our Mother Gertrudis, telling her how God had providentially granted them such a distinguished benefactor. Mother Gertrudis answered them, begging them to talk to Father Kavanaugh about us, which they did with great effort, later putting the Father in direct communication with our Mother; he offered to do whatever was in his power to try to help us resolve our situation, receiving us from then on with great charity and kindness. Shortly afterward, Father Kavanaugh had to travel to preach in La Jolla, California, an occasion which Mother Gertrudis took advantage of to telephone him, begging him to receive them so that they could speak to him about issues that concerned them but he, with his fine and delicate charity, told her, "No, Mother. You are cloistered. I will come to your house." We will never forget this exchange, which opened our soul to hope. We were in awe of his magnanimous heart, which demonstrated a spark of the immense charity of the Heart of Jesus. He asked that we continue praying to the Lord that He would help him, and that we would find the certitude that soon all would be well. On September 1st, 1928 at 11 a.m., the ship "Harvan" docked in San Francisco Bay, bringing with it our community. Father Kavanaugh wanted us to first stay with the Carmelite Sisters, who welcomed us with great charity and offered us magnificent food. After eating, we agreed that Mother Matilda, the Mistress of Novices, would first go to our community's new home in the Haight-Ashbury district to begin putting the house in order. 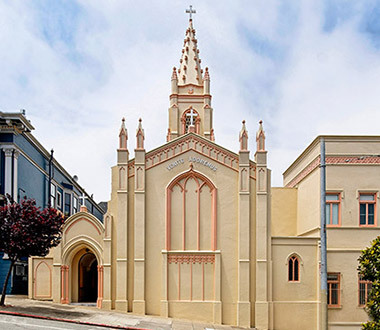 Father Kavanaugh spoke a little Spanish, and he asked us whether we were afraid to go given that the large house on Ashbury wasn't yet completely vacant, and the woman who lived there was ill with measles. Mother Gertrudis told him that we weren't afraid, but that as a precaution against infection, it would be better if we stayed in one of the small guest houses or in the apartments facing Downey Street on the opposite side of the property. Once this was resolved, Father Kavanaugh and others helped transport the Sisters there in their cars. Once we were all reunited, we experienced great joy and happiness, and we were astonished to already feel at home with some comforts: we already had all the beds and chairs and necessary items for the kitchen and refectory. Shortly afterwards, two trucks arrived laden with all kinds of supplies: various kinds of cereals, canned goods, fish, fresh fruit, milk…all chosen with careful diligence by our magnanimous Father Kavanaugh. Nothing escaped his fatherly heart; he soon brought us a comfortable chair so that one of the Sisters who was ill could rest, and he also got her a doctor and medicines. Finally, leaving us well settled in, he advised us at last to eat and sleep well—advice which we followed to the letter. The next day at 5 am, Mother Gertrudis woke up with her soul full of joy and from her bed began to sing in her sweet and tuneful voice, "Beloved Jesus, how can I repay you with my heart and soul for what you are doing, and what you have done?" a song which is traditional in our Order and which had a special meaning for us at that moment. That morning, September 2nd, 1928, we could not have Mass because we didn't have the necessary items arranged for it. We quickly designated the best room in the house as the provisional chapel so that we could celebrate our first communal act of the morning: prayer, the rosary, and the Divine Office. We spent the rest of the day trying to arrange all the things we had brought with us; the rest that we had ordered from San Diego (refectory tables, piano, armoires, etc.) would arrive later. On September 3rd 1928, we had our first Mass as a community. Father Kavanaugh came to celebrate it, and he continued celebrating Mass with us for several days. He was also constantly making sure that we never lacked anything we needed, whether spiritual or material.